Imagine sitting solitary in the ocean, bobbing up and down on your surfboard, taking in the ocean breeze, waiting for the next wave to roll in. What else would you want in that moment of near-perfect isolation than to see a tweet from one of your followers? Right, me neither, but apparently that's what Samsung thinks we do, so it went ahead and made a Galaxy Surfboard. The company's Brazil YouTube account posted a video starring pro surfer Gabriel Medina riding its surfbort (surfbot?) creation, displaying text messages from his father/coach parked on the beach and tweets from fans who use the hashtag #GOMEDINA. The board does have some usefulness as it relays information on ocean conditions, wind direction and wave height and frequency. The high-tech shredder runs on a Galaxy phone inserted into it like a DVD, and presumably has some internet connection. 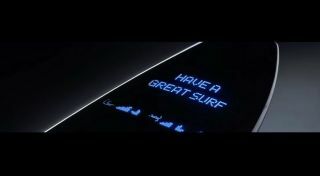 While most surfers will probably scoff at the thought of being ultra-connected in what is an activity that generally communes them with nature, not technology, it doesn't seem as though Samsung is preparing the board for mass production. At least, I hope not. Or, maybe it's the wave, so to speak, of the future, and I just need to chill out.